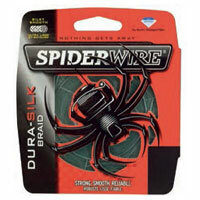 Introducing SpiderWire Dura-Silk a trustworthy and reliable braid with Spiderwire performance. Dura-Silk is a super strong, super thin braid with incredible knot strength. Dura-Silk is soft and flexible and features a round, full bodied construction that resists wind knots. Dura-Silk is both extremely durable and shock resistant and its strength makes it ideal for fishing heavy structure where durability and strength are key to extracting strong fish.  Made from 100% Dyneema, the world's strongest fibers.  Round full bodied construction resists wind knots.  Near zero stretch for ultimate sensitivity.